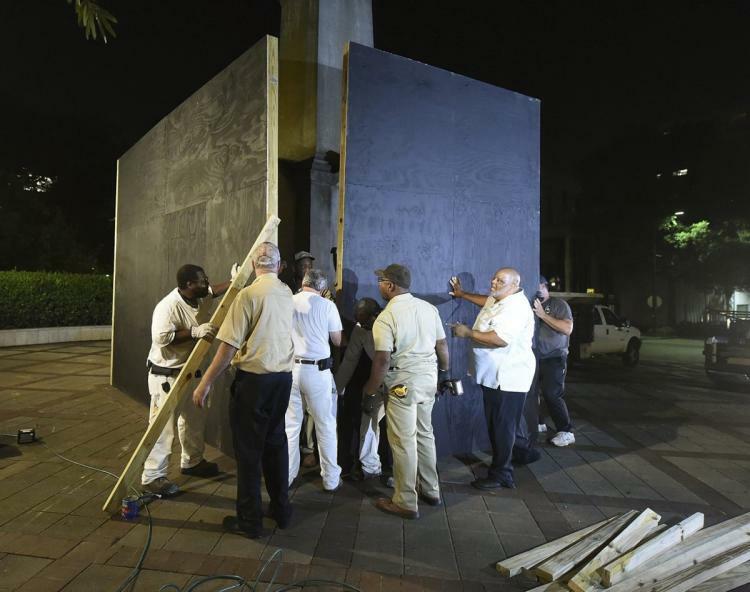 City workers install plywood shield around Confederate monument at Linn Park in Birmingham, Ala.
A judge has overturned an Alabama state law preventing the removal of Confederate monuments from public property. A ruling issued yesterday by Jefferson County Circuit Judge Michael Graffeo says a 2017 state law barring the removal or alteration of historical monuments violates the free speech rights of local communities. Graffeo says the law cannot be enforced, but the state of Alabama could still appeal. Attorney General Steve Marshall’s office had no immediate response to an Associated Press email seeking comment. The state sued the city of Birmingham two years ago after officials tried to remove a 52-foot-tall obelisk erected to honor Confederate veterans in a downtown park in 1905.